This beautiful, rich, moist – need I go on? 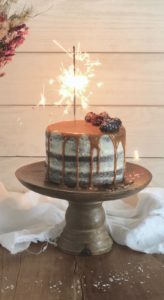 Chocolate Stout Birthday Cake with Sea Salt + Bourbon Caramel was created for my husband’s birthday back in March. 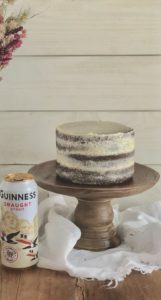 Although he is not Irish, his birthday does fall four days prior to Saint Patrick’s Day, and what lover of beer wouldn’t appreciate a pint of Guinness stout added to their birthday cake adding depth and richness?! To top it all off I made sea salt and bourbon caramel, with Bulleit Bourbon. This cake also makes a beautiful naked cake. In the process of decorating, I covered the cake with a sweet cream icing. I would most certainly make this cake again, leaving it naked and adding either fresh flowers or fruit, or both. 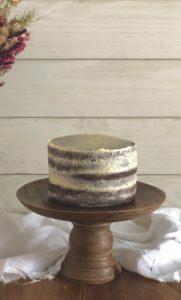 Stout beers are often described as having chocolatey overtones, therefore the presence of the stout gives this cake a dark, rich color and adds an added richness to the chocolate. 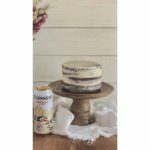 The cake itself is very simple to whip up and if you don’t have a stout beer on hand, any dark beer can be used to replace the stout; if you flat out don’t have any beer on hand, a strong cup of black coffee or water can replace the beer altogether. The sea salt and bourbon caramel seemed daunting at first to make. Caramel has always seemed like something an intermediate baker makes. This was my first time making it and it was truly simple! It took all of 15 minutes from beginning to end. 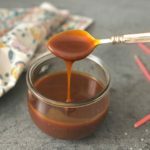 The only part – you have to pay close attention so that your sugar doesn’t burn, but hey 15 minutes to create a beautiful HOMEMAYD caramel, easy peasy! And it lasts in the fridge for roughly one month. We have been dipping bananas in it, putting it on profiteroles, vanilla ice cream, you name it! A cake that won’t soon be forgotten. The stout adds depth to this extremely moist cake. 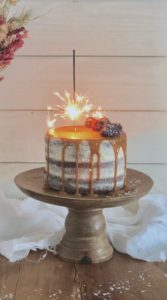 Leave the cake naked with the sweet cream icing, or splurge and top it all off with this incredibly simple sea salt and bourbon caramel | HOMEMAYD of course! Preheat oven to 350 degrees Fahrenheit; and prepare three 6 inch pans with butter and a light dusting of flour. Place butter into small skillet and heat until golden brown in color. Then whisk in cocoa powder. Set aside. In large mixing bowl add | flour, baking soda, baking powder, and salt. Whisk. Then add on top of the dry mixture | the stout beer, eggs, milk, vanilla, vinegar, and the butter and cocoa mixture. Whisk everything together for about 3 mintues. Measure 1 1/4 of batter for each cake pan |three pans| and bake for 30 minutes. Place sugar in medium size skillet and shake to disperse the sugar over the pan creating an even layer. Heat sugar over medium flame for about 10 minutes until the sugar dissolves and turns into a rich copper color | like a penny. If there are areas of the sugar that are taking longer to dissolve, gently fold those areas into the quicker cooking sugar with a rubber spatula. In a separate pan gently warm the cream and the butter over low heat until the butter is melted and the mixture is just slightly warm. Once the 10 minutes is up and the sugar is copper in color, turn all burners off and pour the butter and milk mixture into the sugar | whisk constantly. The mixture will rapidly bubble. Once the butter and milk are thoroughly combined with the sugar, turn the flame back on low for a few minutes more and whisk in salt and bourbon. The caramel will continue to thicken as it cools. Use immediately; or store in a glass jar in fridge for about one month. Place mascarpone cream cheese in mixing bowl and whisk in honey, milk, and vanilla. Use immediately; or the icing can be kept refrigerated for two weeks. Once all layers of the cake are cooled, flip all the layers over. The bottoms will now act as the tops to create a nice flat surface for decorating. If when baking the centers of the cakes rounded, level the cakes out with a sharp knife. 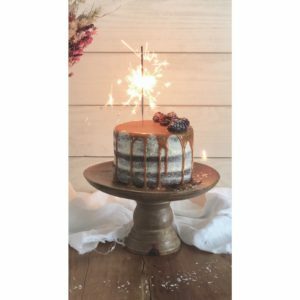 For a naked cake use a large icing knife, apply a quarter of the icing in between the layers; then the remainder to the outside of the cake. Slather the cake with the icining, then continue to scarpe the cake until desired rustic, naked look. 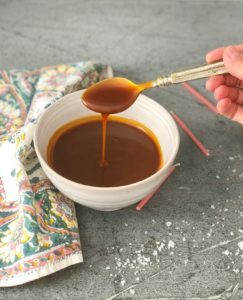 If applying the caramel || gently pour caramel onto the center of the cake and wait a few mintues to let the caramel naturally dissipate on its own. The caramel will slowly make its way down the sides of the cake. Add small amounts at a time | 1/4 cup until desired amnout and drips form. 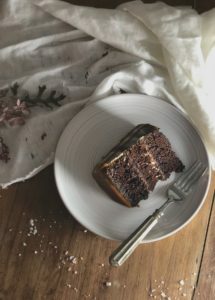 This recipe is my go to chocolate cake recipe, yet I most often times use one cup of strong black coffee. As for the sea salt and bourbon caramel, I used Maldon sea salt flakes. The sea salt and bourbon caramel was an extra special treat, as my husband absolutely loves the combination of chocolate and sea salted caramel. This cake describes him to a “T” – lots of depth, a bit salty, and a bit sweet. Let’s not forget the bourbon drenched part, his drink of choice. 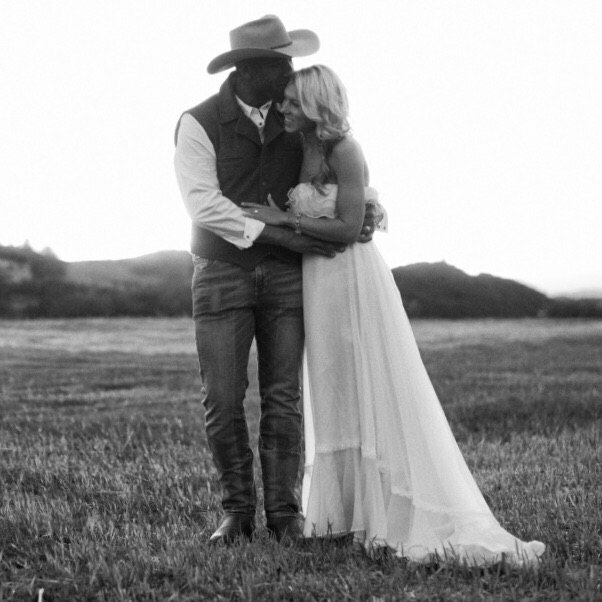 Happy Birthday to my husband! This post was long overdue – first I was away, then I contracted some Northeastern bug that had both my daughter and I down for the count for nearly eights days. What was that?! 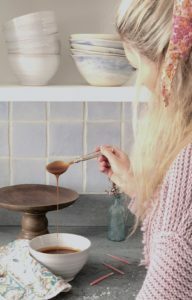 Thankfully we are both feeling better – relishing in the first stringlike days of the year and developing recipes again! King Arthur All-Purpose Flour and Vermont Creamery Mascarpone Cheese. I use only nut safe ingredients | products in all my recipes. Every time I go to the market, I check the ingredient list and allergy disclaimers posted beneath the ingredient list; even though I checked this information the week before. I check this list prior to each purchase as the company may have had a change in manufacturing facility | plant. Soon you will be able to refer to a blog post on How to Navigate Food Allergens for a safe home. I have had this cake that you made and it is scrumptious! !